I saw her reflection in the window of the Tobacconist. She was crossing the street and heading for the restaurant at The Windsor Hotel. You might be wondering how I knew where she was going. Where else would a beautiful young lady be going, at that hour of the day, dressed so impeccably? Her lipstick matched the colour of her dress. Her handbag was suitably casual, and her figure was close to perfect. She had the kind of body that made you wish you could win a scholarship to undertake further study. She was smoothing down a stray hair as she stepped off the kerb and as if by magic, the busy lunchtime traffic came to a halt. If I’d tried it you would have read about the carnage in the evening paper, but this is 1957 after all, and a beautiful woman will always stop traffic in this modern age. I’ve got a thing about white gloves. My mum had a drawer full of gloves, and they always smelled amazing. She looked great when she wore them. When things got to be too much, she would dress up and keep me home from school. We’d walk down to the tram stop and jump on the first number 12 that came along. The journey to the city took about half an hour, and we would travel that distance without conversation. I would sit next to her and feel her warmth and smell her perfume. Sometimes she would hold my hand. When she could not be here anymore, they found her, perfectly dressed, careful makeup and white gloves. I was outside the Windsor on a routine ‘follow and report’. Not my usual pastime, but a friend was shorthanded, and I didn’t have much on. Melbourne is quiet now that the Olympics is over. Most of the juicy crime has moved back to Sydney. The lady in red was still delaying traffic when I saw my mark enter the Hotel. The bookstore next to the Tobacconists would be a good place to wait; no one notices a person in a bookstore and the staff know to leave the customers alone. Fortunately, the ‘classics’ section was close to the front window, so I picked out a Tolstoy and settled in for a long wait. The curtains in the dining room at the Windsor were draped but not completely closed, so I could see my mark sitting one table in and to the left of the main window. I was expecting to be waiting for at least an hour but my curiosity, professional and otherwise, wanted to know who else would be seated at his table. A well placed ten-pound note would get me all the information I needed from the staff, but that would come later, for now, I just wanted to see for myself. I didn’t have long to wait before a large, not very tall, bald man in a bad suit sat opposite my mark. Their demeanour suggested that they knew each other, but I doubt that they spent their holidays together. Four minutes later, the bald bloke got up and left; there was no handshake, but he didn’t tip a glass of beer over him either. Next to the man’s description I wrote, ‘strange, short meeting’. To my delight, the lady in red, fresh from her traffic stopping duties, appeared in the window and stood approximately where the bald, bad suit had sat. My mark grew about two inches in his chair and to put it mildly; he looked a little bit surprised. There was too much traffic, too much distance and too much glass for me to be able to hear their conversation. But, as the man said, ‘actions speak louder than words’. The lady in red opened her casual handbag and reached into it with her perfectly gloved hand and pulled out what looked a lot like a chrome-plated .25 calibre Browning automatic. I didn’t hear the bangs; a .25 doesn’t make a lot of noise and the slugs it projects is not likely to do a lot of damage unless they land in the right spot, and at that range ‘white gloves’ was not going to miss. My mark made a face that made it look like a large dog had attached itself to his family jewels, then he slid gracefully off his chair. Miss ‘white gloves’ must have hit the spot. I expected to see a flurry of red and white but to my surprise, she slowly put the gun back into her casual purse and moved toward the door. I didn’t expect to see her emerge because there was a good chance someone would grab her now that her gun was back in her bag, but I was wrong again. She stepped through the polished brass front doors, said something to the doorman, who smiled at her, then she stopped traffic again and walk toward my hiding place. I expected to see a posse of concerned citizens come bursting through those shiny doors, but again I was off the mark. “Yes, I guess that would be wise,” she said, looking slightly dazed. “Yeah, me too.” I wasn’t talking about catching my breath because of the shooting, I’d seen a lot of that, in and out of uniform. Waiting out a sniper was easy compared to dealing with a beautiful woman. A gunman only had one way of killing you; a beautiful woman could choose from dozens, and do it with a smile. I hadn’t yet decided if ‘white gloves’ was one of these or not. “If you don’t mind me asking, why did you do it?” My Tolstoy was light weight compared to what was unfolding in front of me so I put it down. I pulled my hat down over my eyes and resisted the urge to run to the car, but even at walking pace, I had the old Ford at the back of what I thought was the book shop in time to see the lady in the red dress step into the laneway. Within moments, she was in the car, beside me. I’d been running on instinct up till then but now, in the relative silence, I was wondering why I was doing this. There was a slight drizzle falling so I turned on the wipers. If this went ‘pear shaped’ I was likely to be staring into a very bright light in the basement of Russell Street Police Headquarters before too long. I’d been rousted by the police a few times before, even been roughed up, but compared to my sergeant and the Japs, police were a bunch of lightweights. Even so, I didn’t need the trouble. After a few minutes, it occurred to me that I was driving, but I didn’t know where. Despite its name, Cafe What? was actually a bar. It had been named that way for so long ago that no one could say with any accuracy how long it had been there, or who had come up with the name. Everyone needs somewhere to go and the particular band of ‘everyone’ who went to Cafe What? were generally not welcome anywhere else. Being an outcast brings with it a fierce brand of loyalty towards other outcasts. No matter what happened at Cafe What? when asked, everyone was deaf, mute and blind. We drank something that had all the punch of a newborn kitten and then drank a couple more. She paid an exorbitant amount for the drinks and the rest of what was in that envelope for the certainty that she had been there all afternoon. I drove her to the address she gave me, parked around the corner and took her inside. I wasn’t taken completely by surprise. I am over twenty-one, and this is 1957. The world spins a lot faster since the war ended. I took off my hat and pushed her gently up against the wall. My lips were in working order and so were hers. I waited for a polite amount of time before I pulled her dress up to her hips and put my hand between her thighs. She didn’t try and stop me, and it is enough for you to know that I did what any good soldier would do in the circumstance. We moved around the house violently bumping each other for several hours. My legs felt like jelly by the time I walked out of her front door. I knew it was wise to park around the corner, but now I was regretting it. My hat was the only part of me that didn’t hurt, but it took a week to get the smile off my face. I don’t know why, and I don’t care, but the police never worked it out, and the lady in red paid up for an alibi that she never needed. The friend I was working for on that day asked me if I had seen what had happened and I gave him a smile. He got paid and so did I, and we went about our business. 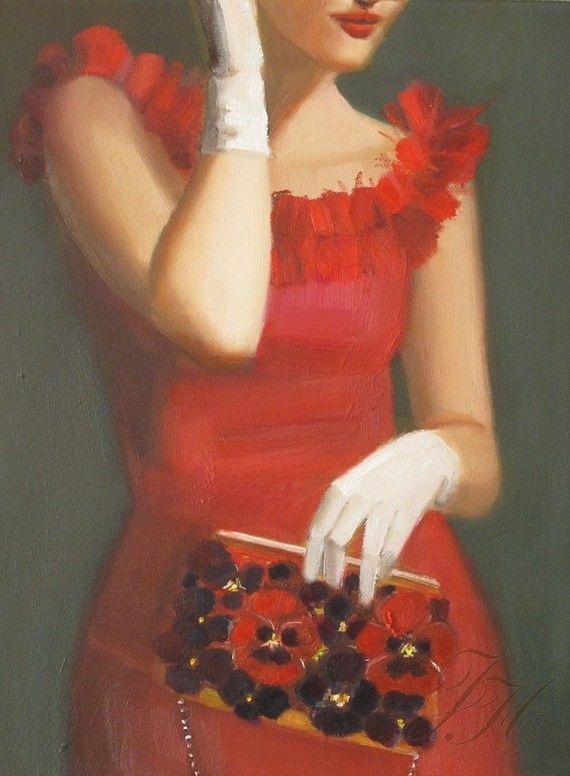 I think about the lady in red from time to time and among the myriad of things I wonder about, one of them is why, throughout our torrid encounter, she never removed her white gloves. ← Dinner, Dance and a Show. Thanks Peter….. this one was extra fun. This reminded me of Noir/neo-Noir movies. Gritty, exotic, mysterious, murder and intrigue. I picked it up right away. One of my favorite genres. If only I could write it good. I love this style of writing, and I come back to it from time to time. My first novella is written in this style as well. It is called ‘The Long Weekend’ and you can find a link on the right hand side of the page. Thank you for taking the time to comment. It is always good to know that there are people out their who are enjoying my stories. P.S. The book, ‘The Long Weekend’ has it’s own blog page and i post stories about the two main characters ‘Sam and Scarlett’. These are free to view and you do not have to have purchased the book to read them…… enjoy. Well, I laughed really hard at “picked out a Tolstoy and settled in for a long wait” and the smile stayed on. Terry, why doesn’t some smart magazine down there scoop you up for weekly cozy mysteries with a strong sense of place and a sly sense of humor?) And, on a completely different note, did I ever tell you that I stayed at the Windsor once? Lovely old hotel. Thank you Lori. It seems that I am officially Melbourne’s best kept secret….. possibly Australia’s. We love staying at the Windsor [although the budget won’t stretch that far these days]. It is only a matter of time before some developer convinces a conservative planning minister to let them pull it down and build a modern glass monstrosity, but for the moment she is still there, and she will always be the place that I wrote the third act for ‘The Long Weekend’. On the other subject……… I’ll keep writing them and maybe someone [other than your good self] will notice. Thanks for taking the time to lift my spirits.